I've got good news and bad news: It's a buyer's market. For real estate investors it's a "catch 22" of sorts and it's tough to make heads or tails of what's going on in this troubled economy. You know as well as I do banks are practically giving properties away. You can throw a rock and hit a good deal - it's just that easy! It's NOT hard to find bargains because banks are overloaded with foreclosed properties and motivated sellers are begging to give their homes away. Adding to the fire, lenders are in shock and the economy is still in a very fragile state. Mortgage companies aren't as "generous" as they once were and things have gotten really tough to get money to buy, especially for investors. The rules of the game are changing and if you want to survive and thrive as successful real estate investor in today's market you need to put all the pieces of the puzzle together. We all wish we could go back to the good days (even just 5 years ago), when it was easy to sell real estate. Just list your real estate on the market, maybe place a classified ad, and you're all set. Lines of credit were plentiful, prices were soaring and buyers (both investors and retail buyers) were lining up for miles to get their hands on any deal they could. That's not the case anymore, at least for most. Even many seasoned investors unable to sell their properties in this market have called it quits for the time being. And while it's never been easier to get your hands on cheap deals, for a new investor it's much scarier to get started in real estate. Imagine getting involved in a property and despite everything you try you just can't sell it. Savvy investors know how to make the most out of ANY market and that's exactly what I've done. In THIS MARKET I've been able to sell as many as 35 properties in ONE month. Heck I even sold 12 properties from TWO emails - just a few clicks of the mouse. And I'm able to profit BIG from every deal I do! Isn't that one of the reasons you got into real estate investing in the first place - to have total control of your time and money? And it doesn't take a lot of effort or skill you just need to know the system. BUYERS ARE OUT THERE... AND THEY ARE BUYING! I can say this full confidence from first-hand experience. You just have to know how to find them. As a result of this "bad economy" I created systems to use in my own investing business letting me adapt and PROFIT while other real estate investors stand around scratching their heads completely bewildered of what to do next. The best way to survive and THRIVE in this "crappy" market isn't chasing killer deals. Bargains are everywhere - that's the easy part. Successful investors know RIGHT NOW buyers are the most important piece of the real estate profit puzzle. Wouldn't you like to have dozens, even hundreds of highly-qualified buyers waving money at you fighting over every deal you do? If you're currently sitting on houses or land you can't sell imagine what that would do for your business and your life. Just think of all the stress and sleepless nights you could put behind you and finally enjoy a healthy income and leisurely lifestyle. And if you are new to real estate investing just think of the goldmine in front of you. Thanks to today's market the buying and selling sides of the transaction are practically done for you. What else is there than to enjoy your profits? The good news is there ARE buyers looking for exactly what YOU have to offer armed with the funds and resources to close deals. They are actively buying - and buying a lot. With Offers They Can't Refuse! You just have to know where to find them and give them exactly what they're looking for. The SECRET to selling properties is getting in front of buyers who WANT and are ABLE to buy! Not only that but develop a LIST of these buyers and sell to them over and over again. That's the key to making real money in today's real estate market. I've developed a system that does exactly that. This online training system is designed to give you a complete proven blueprint to finding high-quality buyers, targeted and ready to JUMP on every deal you do. In this program I take you by the hand and walk you through each detailed step of my proven buyer getting process. Over the next three weeks you will be going through 6 classes with me personally LIVE. And of course you will afterwards have forever access to all aproximatly 9 hours of, easy to follow, training so you can watch and rewatch it and take notes and impliment it at your leisure. Where to find HOT buyers with MONEY TO SPEND! There are buyers wanting to buy, highly qualified and extremely motivated to do deals with you. Discover the different types of buyers, who these TARGET buyers are, how to get their attention, and how to sell to them over and over again! The little-known tactics to making the biggest search engine in the world, Google, your best business partner and get hundreds of dollars in FREE Pay Per Click Advertising. The cutting-edge secrets to making "Traditional" offline marketing such direct mail, signs, newspaper ads, classifieds, and flyers work today! I'll show you how to BOOST response to these "old-school" methods and get them to work for you fast and cheap! The secrets to auctions and selling ANY property in 7-days or less! The difference between a live auction and Round Robin auction. When best to run an auction and WHEN NOT TO! How to make eBay work AGAIN! Most real estate investors say eBay is a waste of time for selling properties. I'll show you what they're doing wrong and my top-secret strategy I use to repeatedly sell several properties each month using online auctions with ease. Leveraging the hottest trends in Social Media! You see it everywhere - things like Twitter, MySpace and Facebook. It's capturing the attention of the world and that includes your buyers. Be the first to discover my never-revealed before strategies I use to build an iron cage around the masses of buyers using these new and rapidly growing Internet "hang outs." I'll show you how to get started on these social networks FAST - you'll be up, running and in front of potential buyers in minutes. Using the Multiple Listing Service without being a Realtor. I'll even show you how to get around any restrictive listing agreement limiting how you can market your property. You can sell FASTER and CHEAPER than what any real estate agent can do for you. ...I really really liked your program. This definitely was hands on the best program that I have ever seen from you. Gives a lot of clarity on where to find the buyers and how to build buyers lists and just everything. Gives you all the tools that you need to be a success with buying and selling land. 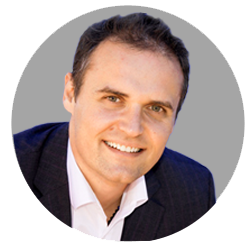 In the Masses of Buyer System I deconstruct the very same methods I use to find hot buyers, build massive buyers lists, sell several properties a week hands-off, and PROFIT BIG on each and everyone. You can jump right in to each module and start using these tactics right away to selling properties at record speeds and apply the new strategies as you go through the program. Finding the PERFECT hungry buyers with money in hand. Who to target, and where to look for them. The difference between online marketing and offline marketing. How to use both to maximum effectiveness to attract the hungriest buyers. Why you MUST build a list to survive in today's market. Two types of real estate investors who buy like crazy, and how to create a deal that fits each one best. The three types of buyers - Investor buyers, end buyers, and "wait, see and enjoy" buyers. How they buy, why they buy, and how to get them to repeatedly buy from you. How to tell a story with your advertising and create a dream property leaving buyers frothing at the mouth and ready to close the deal. Offline marketing - getting highly targeted magazine and newspaper ads cheap and effectively using "dinky" flyers and signs. How to hold live auctions and conduct round robin auctions. "Steal" visitors from large popular, highly visited websites like Craigslist and eBay for an endless inexpensive (and even FREE) source of hungry buyers. The fast and easy want to set up your own website even if your completely "technology challenged." I walk you through everything you need to do to get your website up and running. How to get a professional property selling website set up for ABSOLUTELY FREE. Use this little-known resource and you won't have to pay a red cent to market your property on the Internet for thousands to see. There's no set up fee, no monthly costs or maintenance fees, and the best part is... It's All Done For You! Using video, audio and virtual tours on your website. I even reveal the closely guarded tools I use and how to use them. Make your online and offline advertising work together to maximize impact on buyers. Running your own online real estate auction. Using Realtor.com and Zillow.com to your advantage. Creating offline "events" to grab the attention of your local community. Online video tips to quickly capture attention from views and have them taking the next step - joining your list of buyers. Using Pay Per Click marketing through Google and other search engines, advanced online marketing strategies and "image ads" to quickly drive website visitors to your property websites. Why Google will happy give you hundreds of dollars in FREE Pay Per Click Advertising. Get thousands of eyeballs on you website all courtesy of the world's largest search engine. This is one my favorite "tricks" I like to keep up my sleeve all to myself, but in this module I give you the secret. At this point I should tell you I originally planned to do a four-module training but there was just so much I had to share with you I decided to do two extra coaching modules. And while I squeezed as much as I could into the first four training videos, these last two are every bit as important and could mean big profits to your business. Remember, more buyers = more sales! Going where buyers gather online in fast growing social networks. Connecting into an "automatic" buyers list in your area and all around the country. There's a fast way and a slow way, I'll show you both and you can decided which route to take. Using Facebook, Twitter and MySpace. The mass media like CNN, CNBC, ABC News and even Oprah are using these mega social networks but very few people know how to effectively sell real estate through Social media. I'll walk you though how to do just that... without upsetting your followers or breaking "The Social Networking" rules of engagement. How to create an irresistible offer where buyers can't help but see the massive value in buying your property. Offer financing options to sell quickly. Module 6: eBay/Craigslist/Article marketing and Making It All Work Together. How to use eBay the Smart Way! The new rules to sell quickly and have tons of bidders fighting for your deals. Making your Craigslist ads STANDOUT and strategies to better manager your ads. Using online article marketing to drive buyers to your website. How to easily write articles FAST. Where to get topics, where to place your articles, and if you don't want to write how to have it done for you. My personal secret weapon for catapulting your online property listings and selling web pages to the top of Google in no time flat and completely FREE! I call it the A-9 Process and it's so powerful you could run your entire "buyer getting" campaign around this single strategy alone! The template to creating your ultimate buyer getting business card. Putting all the pieces of the program together. Everything I just listed above barely scratches the surface of the knowledge and skills you'll gain from the Masses Of Buyers Online Training System. ...I think you pointed out some really good things about how to make sure you go out and market well to your customers. I think it is useful not only just for land but good for a lot of the programs that we meet with. Just want to thank you, say great job and look forward to working with you and working on more land going forward. ...So I put it on the market on Craig's List for $7900 bucks and within less than 2 weeks I got all kinds of calls. And one of those calls just happened to be somebody who they called and then they just hung up, they never left a voicemail or anything. So I ended up calling this person back, I wasn't even going to bother because I figured they would just leave a voicemail but they didn't. So I decided to call them back and it just happen to be somebody, they were from a different state all together, they had never seen the property, they didn't even really want to. They were just willing to send me, flat out a cashier's check for seven grand. It was as simple as that, they did it and I got the money and within less than 2 weeks I sold it. That is an incredible process for $150 bucks turn that into $7000 dollars and it was a great deal. It wouldn't have happen if I hadn't called back this mysterious caller and made it happen. First of all I just want to say thanks Jack; you've got an awesome system. It's done wonders for me. I hope it continues to do that I'm sure. Just wanted to share that little story and let you know how that happens. Thanks again, I wish you the best. This program fills the gap where other real estate investing related courses, trainings, seminars and boot camps ignore completely - how to find buyers quickly and easily in TODAY'S market. It may seem like a lot to go through but I assure you it's a simple approach that anyone can take and use in their business to bring in floods of buyers and sell properties at rapid speeds for higher profits. You can even take this course and have a staff member, employee even a virtual assistant go through the easy to follow systems I've created and have them implement these strategies for you. While Doing A Whole Lot Less! It's amazing how your business (and your income) can change when you put things on autopilot and with this system you'll have thousands of buyers looking for you automatically. Imagine creating a tidal wave of profit, success and abundance by selling high-profit (and easy to find) deals to sellers waving money in front of your begging to buy. What Would A System Like This Be Worth To Your Business? I've personally invested tens upon tens of thousands of dollars and countless hours attending seminars, personally working with marketing experts and gurus, testing these strategies and making sure they work. Because I knew that selling properties was KEY to not only surviving in this market, but thriving. I knew I needed buyers and HAD to find A LOT of them FAST for my real estate investing business to work in this economy. It didn't matter how many great deals I could get my hands on, if I didn't sell I didn't profit. And in business that's all that matters. So what would selling one deal do for you? Say it's a wholesale deal where you quick turn a property to another investor - on average it would be $5,000 at the very least. What if you could do several deals just like that in one month? At the very least this program would be worth $5,000 at a minimum in today's market. But I know with the economy the way it is real estate investors are hurting and really need the information I share in this program. So with that in mind I've decided to price this system at an investment any serious investor could easily afford as a market test. Honestly I can't do this forever because I don't want just anyone knowing my hard-won strategies for quickly selling properties in this market (and in any market) so chances are the next time you visit this page the price will be dramatically higher. You see, because of the time I invested in developed the system and in the creation of the videos I originally thought to price this program much higher at $997 - and that still would be very reasonable investment for what I share with you. And I still may decided to raise your investment price of this program any day. But if you act right now you get it for a fraction of that price - just $997 $397. Yes, Jack! I want Masses of Buyers! And I'm not going to let you let me off that easy. 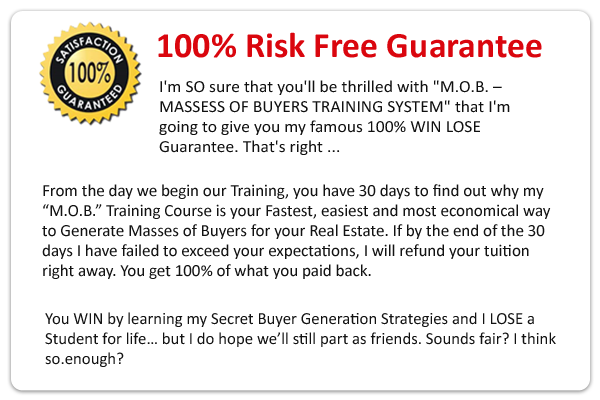 For accepting my offer in addition to the Massed of Buyers System I'll also include 3 KILLER bonuses to help you sell more real estate in less time for MORE money. These bonuses are my FREE gift to you for taking me up on my offer today and are a total value worth over $14,000! This is a live presentation I recently recorded on the Top 12 Success Principals that have helped me reach the success I enjoy and have taken me from a German immigrant with two suit cases and a load of student debt to a real estate millionaire. These are Everlasting Principles who have worked 1000 years ago, 100 years ago, and which work today as well as will work in the future. I normally charge $97 for this DVD but it's my gift for you today for taking action now. This is GOLD! I built up this database of Land buyers over the years and present them with new properties on a weekly basis. I will allow you to have your properties featured on my weekly email notifications to this list. I've done MILLIONS of dollars in business as a result of this list and it's truly priceless. But if I did have to put a price on access to putting your deals on this list I would say a conservative $9,997. But as a "MOBs" member you'll have access to get your deals in front of these prime buyers as my gift. You will recieve not one, but TWO tickets to my 3 day teaching seminar which usually sells for $1,997 each. I've only held this event once before and like last time, I plan on over-delivering. This won't be a pitch fest like so many other seminars out there, just pure wealth building content straight from me and my team complete with detailed insights of what I do in my business every day. That's over $14,000 In Value adding Bonuses Yours Free For Acting Today! Order Now, To Receive These Bonuses! Order Today, and Try this Program Risk FREE! Please understand, this level of detailed step-by-step buyer's list building education can't be found anywhere else. If you're not an active investor but want to be (or afraid to get started) - and know now more than ever is the best time to get into real estate, knowing how to sell properties as fast as you can buy them will change your INCOME and your life. And if you're ready for massive success in real estate because the market is so rich with profitable deals around every turn the Masses Of Buyers System will help you take full advantage of this once in a lifetime real estate market. YES JACK! I want to Sell my Deals as Fast as I can Find Them! I understand that for a limited time only, I can get INSTANT access to the Masses Of Buyers System for only $997 $397. I'll get full access to the SIX modules covering every aspect of finding buyers online and offline detailed step-by-step. Once I claim my spot in this program I instantly get my secure username and password that I can log in immediately to start implementing our buyer getting strategies right away - even if it's 2:00 in the morning. I understand that I get a 100% money back guarantee. I can review the entire program and if in 30-days I'm not completely satisfied for any reason I can just contact your office and I'll get my full investment refunded no questions asked. I also understand that this price may go up at anytime in the near future and am securing my place in your program for the current low investment.